I arrived in Wisconsin on July 21 to watch the South Bend Cubs take on the Beloit Snappers, making sure to arrive early enough to watch batting practice and drills. One of the players I was most interested in learning more about was infielder Austin Upshaw, the Cubs’ 13th round selection in 2017 out of Kennesaw State. In talking with South Bend broadcaster Darin Pritchett, the two words that kept coming up to describe Upshaw’s skills were “very good.” Hitting: very good. Fielding: very good. Arm: very good. Makeup: very good. Work ethic: very good. You get the idea. Pritchett got slightly more effusive when describing Upshaw, actually lighting up talking about young infielder and has said on the air that Upshaw reminds him of Chase Utley at times. Currently hitting .329 with a .391 OBP in 19 games. Upshaw is pretty young for a recent draft pick — he just turned 21 on July 28 — but I think that bodes well for his future. Originally from Georgia, the young infielder first attended Georgia Perimeter College before transferring to Kennesaw State as a sophomore. His first season at KSU saw him hit .344 with 7 home runs and 39 RBI. As a junior, he hit .333 with 8 HR’s and 41 RBI. He earned several accolades along the way, including First-Team Atlantic Sun All-Conference his junior year. The Cubs drafted Upshaw in the 13th round of this year’s draft. He went to Mesa for a few games (where he hit a pair of dingers in one game) before skipping short-season Eugene and being assigned to South Bend in early July. In the first few games I saw him play, I came away impressed with his effortless swing. It’s not Mark Grace-like, but it’s still pretty to watch. He sprays the ball all over the field, so far pulling 38.2 percent of batted balls, with 26.5 percent to center, and 35.3 percent to left. That’s a pretty good spread. So far, in 22 games, Upshaw is hitting ..298 with one home run and 14 RBI. 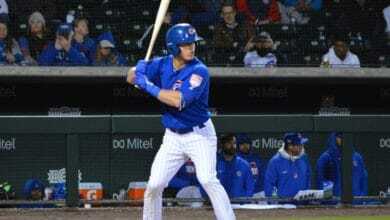 I think he’s one of the better young hitters the Cubs have drafted in the past couple of years. Here is a video I took of him batting during the game I attended. You can see the fluid swing and how his bat glides through the hitting zone even on a strikeout. I had a brief chance to talk with Upshaw afterwards as well. TJ: How is your daily routine different now that you are a pro? AU: There’s a big difference considering school. Sometimes you had to wake up at 7:20 for weights in the morning. Then you had to go to school to practice. But pro ball I can sleep until 11 and still be OK. I kinda had a routine in college, eating wise, getting ready for the game. Things change over time, but I kept the core routine and I am continuing the same thing that I did in college. TJ: What is your approach at the plate? Are you looking for a ball in a certain zone, do you have a certain pitch in mind, or do you take what the pitcher gives you? AU: Sometimes you’re looking for something you can drive early in the count – maybe a fastball in the middle of the plate,but it just depends on what the pitcher has been doing to other batters or just what you’ve seen throughout the game like his tendencies. The coaches do a good job of giving us scouting reports. We usually try to stick to that and use that to have a better plan at the plate. I really think Upshaw is going to be someone to watch over the next year. There are only a few weeks left of this season, along with fall instructs, so most of the observation will have to wait for next season. But it is clear in watching him play that he’s a baseball rat. He looks like a kid who just eats, sleeps, and breathes baseball. Those are good kinds of players to have.